Ontario's electricity system operator, the IESO, recently released multiple reports including a summary page for 2015's supply now inclusive of "dispatched down" data for industrial wind turbines (in the same format as their 2014 summary). This is the one instance during a year I can compare my estimated curtailment the IESO's reported curtailed wind supply. This year there are similarities, such as the wind curtailments significantly increasing, and there are differences, which I've used to adjust my methodology for estimating hourly curtailments. During each of 2015 and 2014, OPG lost 3.2 TWh of hydroelectric generation due to SBG [surplus baseload generation] conditions. 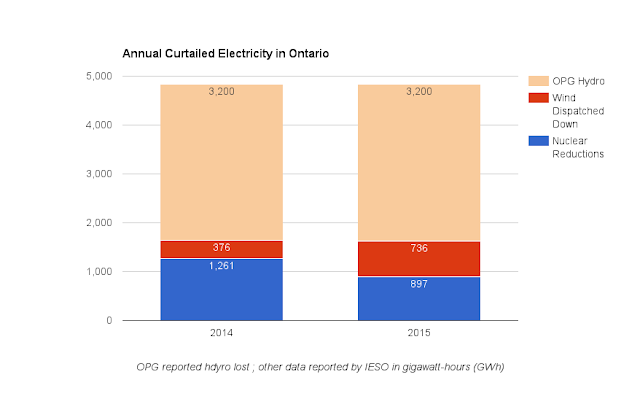 For both years, the OPG hydro losses double the amount of curtailment the IESO shows for the combination of "nuclear reductions" and "wind dispatched down." A comprehensive list of curtailed supply would also include the scheduling off of non-utility generators  , which continues to occur on low-demand weekends. The IESO does curtail solar generators, although the extent is not yet significant. Occasionally the IESO displays a graph of curtailed supply in it's 18-Month outlooks, such as the following one from December 2015. The graphs show "import Cuts", but the annual figures omit those numbers as well. My estimates for 2015 curtailment were developed with testing against forms of this chart (IESO Figure 6.1), omitting the "Import Cuts" category I have no way of estimating. To explain the differences in my wind curtailment estimates, and the lower IESO totals for 2015, I need to explain why I estimate by wind generator, and hour. I'll then note programming alterations I've made today in an attempt to bring my future estimates more in line with IESO reports - realizing I can't control the quality of their reports. In the first 30 days after wind became dispatchable, about 1% of the wind energy that could have been generated was curtailed due to global SBG concerns while 6% of total wind energy available was curtailed due to local SBG concerns. The majority of local SBG concerns were in the northeast and northwest where transmission constraints are more frequent. Wind dispatch in these areas prevented water spillage which was a primary alternative solution to mitigate local SBG in these areas before wind became dispatchable. The IESO knew a lot more back in 2013, judging by the reduced information flow. They do not present information valuable in analyzing the costs of local SBG. My estimates show that this month as much wind generation will be curtailed in the IESO's Bruce zone as will be produced there. The IESO just signed contracts in both their west and southwest zones which they may not have done were they tracking local surplus conditions - and they could have worked to stop the Niagara Wind project now nearing completion in an already congested zone. These projects are, among other things, costs of limited data competency. The primary tool for me in estimating wind curtailment is the IESO's Generator Output and Capability Report. This report has changed deceptively over the years, first adding "Forecast" but limiting it not to exceed the "output", but later allowing under-forecasting to be displayed. This strip for the March 29th report shows hours where it's clear the Adelaide generation is being curtailed (1-4), an hour where it might be (5) and an hour where it isn't - as shown by the output exceeding the forecast (6). This formula shows 2015 curtailment of 1,020 gigawatt-hours (GWh), which is 38.6% higher than the 736 GWh the IESO reports in the new 2015 summary. This is a much greater variance than I saw for 2014 (~17%). With hindsight the lower 2014 variance can be explained by change allowing forecast to show less than output only occurred ins September 2014. I decided to alter my formula. I now report curtailment as 97.5% of the forecast less the output, only when 70% of the forecast value exceeds the reported output, and even then only if the difference is over 4 megawatts. This method produces annual totals less than the straight forecast method in 2014 and so far in 2016, but slightly greater for 2015; I still see 19% more wind curtailment in 2015 than the IESO reports. The comparison of different values using different methods of estimating curtailed wind supply is not particularly important in the end, as all methods show the same trend. Wind is being curtailed more and more frequently, and the highest months for curtailment are the most recent two. The IESO claimed in 2014 5.3% of potential wind energy was dispatched down, growing to 7.5% in 2015. I don't believe their 2015 curtailment figure, but their numbers indicate new turbines were curtailed at 13.9%. The occasions where it is necessary for the system operator to dispatch down industrial wind turbines is rising as the value of output from Ontario's industrial wind turbine is falling. 2. I wrote on this in 2011. It's a much smaller share of curtailing supply than either nuclear or wind maneuvers. As I have nothing to compare my estimates to, I can't address this much further. ...IESO settlement statements for both the wholesale market and contracts are often error filled regarding significant discrepancies relating to energy output versus IESO forecasts, calculation of Congestion Management Settlement Credits, calculations of Foregone Energy Payments, and related foregone energy calculations, resulting in a significant administrative burden for wind generators to audit and track IESO settlements resulting in increased costs to address these settlement issues along with lost revenue based on errors to settlement statements.